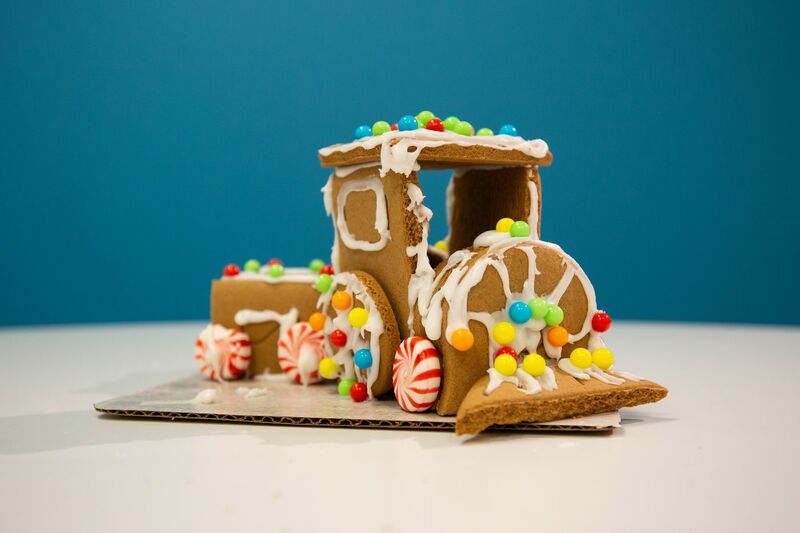 A gingerbread train made with a kit from Five Below. If you’ve ever tried to build a gingerbread house, you probably know it’s a lot harder than it looks. And, no, we’re not talking about the ones you bake from scratch — we’re talking about the ones you can buy in a box from your local craft store. The frosting that comes in the box is never as sticky as it looks like it should be. The cookie pieces topple over before the frosting dries. Pieces of candy wind up all over your table and maybe even on the floor. But this holiday activity doesn’t have to be so difficult. With these tips on building the best gingerbread house you can, you’ll have a festive, candy-encrusted centerpiece to show off in no time. Hershey's Chocolate Cookie Mini House Kit from Five Below. Boxed gingerbread house sets typically include candy and sugar decorations in tiny plastic wrappers, which means it’s easy for candy to go everywhere during the chaotic building process. Sidestep this by pouring the candies into small dishes before you build. Then you can set them aside to avoid messes until your work is fully dried and ready to be decorated. A gingerbread house made with a kit from AC Moore. Most instructions call for you to build the house and wait for it to dry before you move on to decorating, but if you’re pressed for time, you can decorate the individual gingerbread pieces before sticking them together with icing. You’ll have to be careful, but you’ll be able to get that Instagram-worthy picture in less time. Another gingerbread house made with a kit from AC Moore. If your house walls and roof aren’t staying put, use cans or bottles to prop them up as they dry. It can also be easier to build in stages, like waiting to add the roof after the walls are completely dry. When a gingerbread house is fully dry, you should be able to apply a little force to the sides without anything slipping out of place. A mini gingerbread village made with a kit from AC Moore. If you really want to make your gingerbread house look better than your neighbor’s, you’ll probably need to head to the grocery store for additional candy and cookies for decorations. Frosted Shredded Wheat cereal pieces make for pretty snow-dusted roof shingles. Turning an ice cream cone upside down and frosting the outside green will give you a Christmas tree. Use Airhead Sour Belts to create a striped roof. Royal icing — a blend of meringue, powdered sugar, and water — is the preferred frosting of gingerbread house experts because it’s extra-sticky and dries glossy, perfect for those sugar icicles hanging off your gingerbread house roof. I know it’s hard to wait for the architectural frosting to fully dry before you start decorating, because — let’s be real — the fun part is gluing gumdrops and candies shaped like Christmas lights to the house with frosting. But the wait is worth it! Follow the instructions on the box and set the structure aside for a few hours after you’re done and the decorating process will be so much easier. Promise. Add the meringue powder to cold water in a mixing bowl and beat at medium speed to soft peaks, 2 to 3 minutes. Add the sugar, one cup at a time, beating well after each, for a total of 5 to 7 minutes. Store in an airtight container until ready to use. Use to pipe decorative details onto a gingerbread house or cookies.